As temperatures climb into the 90-degree range in Delaware County, the need for box fans increases. The Delaware County Emergency Management Agency and People In Need Inc. have teamed up with area fire departments to collect box fans for people who cannot afford them. Firefighters from the Berkshire, Sunbury, Trenton, Galena Fire District load donated fans into the PIN pickup truck. “Even one fan makes a big difference,” said Kevin Crowley, People In Need executive director. Crowley said PIN has given out 50 fans this year so far and the 24 on the skid were the last until more donations were received. 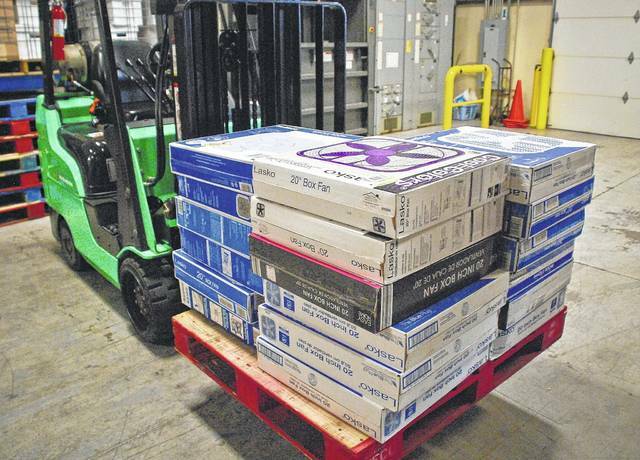 Increasing summer heat means an increased demand for box fans at People In Need Inc. of Delaware County. When it comes to moving the cool air into the house and the hot air out, “Even one fan makes a big difference,” said Kevin Crowley, PIN executive director. 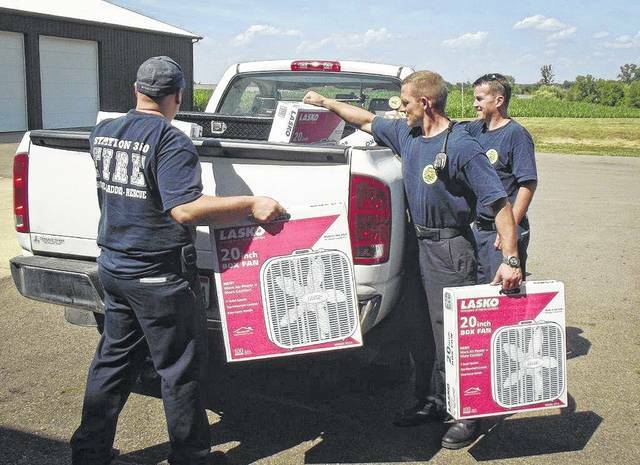 Delaware County Emergency Management and People In Need have teamed up with area fire departments and EMS to collect new — still in the box — box fans. Mackey said the Delaware County District Library is accepting box fans at all of its branches. Crowley said area fire departments will take fans to PIN almost as soon as they get them. All fans collected will go to Delaware County residents that are served by People in Need located at 138 Johnson Drive, Delaware. This entry was tagged Box Fans, Delaware County Ohio, Kevin Crowley, People in Need. Bookmark the permalink.